If you have starlings hogging your suet, turn their world upside-down. 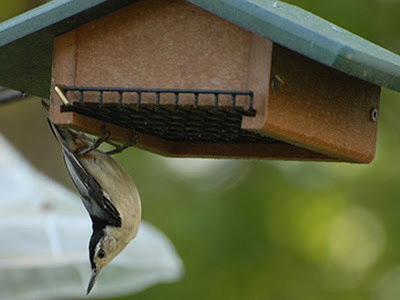 Our Recycled Plastic Upside-Down Suet Feeder is designed to allow birds to feed from below. 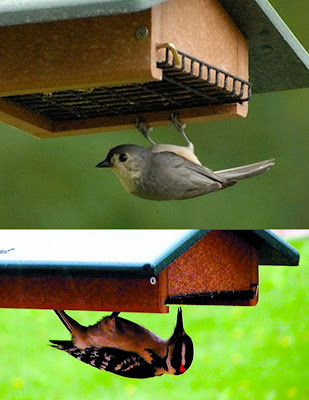 This is a comfortable way for woodpeckers, nuthatches, chickadees and other clinging birds to feed but difficult for starlings. Not only will it help you control your starling population, but it's also easy to refill, clean and hang. Recycled pastic feeders are environmentally friendly, high quality products that are made from recycled plastic milk jugs. These feeders prevent used milk jugs from making their way into our landfills. It won't rot, crack, fade or warp like wood can. They also come with lifetime guarantee and are made in the USA.